Under construction: Due to launch soon. Join 17,000 of your fellow professional marketers! These 4Ps are the cornerstones of marketing on the web. 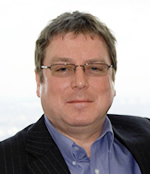 Hi, I'm Mike Grehan, I formed my Internet Marketing Consultancy back in 1995. And I've developed a model for successful marketing online which anyone can use from day one. I used it to build my own online business and it has been adopted by all of my clients to form the underlying framework for achieving strategic dominance over online competitors. The model, like the conventional marketing model, has 4Ps. Welcome to my 4Ps resource site. Visit Mike's search marketing Blog. Positioning: Some time ago the search engine marketing community decided that it needed a more businesslike description and dropped the word positioning for marketing (and relegated the word optimization to the technical side of the industry). However, the word positioning was, perhaps, a better description, because the truth of the matter with search is: if you're not positioned in the top 20 to 30 results then you'll probably never be found. People simply don't click through any further than the second page. And usually, they're on an information search mission when they are motivated to go that far. Getting into a search engine index is not that hard - but getting that all important top 20 listing may be somewhat more elusive. Discover the best books, tutorials, tools and resources right here at netmarketing to start targeting those top 20 positions. Permission: Before the notion of search as the primary method of finding stuff on the web was realized, the "killer app" the internet would brought was email marketing. It's a shame that the "killer app" has almost been killed by those who relentlessly spam us each and every day. The adoption of spam filters and white lists by people trying to avoid the daily clutter in their in box has marginalized the opportunities that existed to get to talk directly with your customer. Unfortunately, it's all too easy to end up as collateral damage in the spam bin even with your own opt-in subscribers. But there's no denying that email is still a mighty powerful tool in the online marketing armory. Because it's when you get this 'permission' to open up a dialogue with your potential new customer that you're able to nurture a one-to-one relationship. 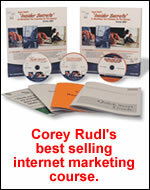 Books, tip-sheets, resources are all here at netmarketing. Partnership: We're using search to drive qualified traffic to our sites and then gaining permission to open that all important dialogue. And this is where we can even get into a business partnership with our customers: by turning them into affiliates. Affiliate marketing is one of the most powerful methods of attracting potential new customers and vastly improving sales. Whether it's a straight forward numbers type program such as Amazon i.e. anybody at all can sign up and start to send traffic and receive commissions, or more selective type joint venture programs, affiliate marketing really works. And it also starts to close the loop. Professional affiliate marketers use search to drive traffic and can build up huge mailing of their own to promote your goods and services. Imagine having a global team of online marketers acting as your sales force! Find the best software, tools and resources right here at netmarketing. Performance: Marketing, both offline and online, is all about return on investment. How much profit do our marketing efforts add to the bottom line. Just as in conventional marketing we have a promotional mix to evaluate, the same applies online. We need to test and measure everything we do online to acquire new customers and improve sales. So web analytics are vital. Does our search budget provide us with the best method of gaining sales. Or does email marketing provide us with a better return. Does our affiliate program work successfully as a promotion and distribution channel? Conversion is the all important word in web analytics. Measuring success is critical to the future growth and development of our online businesses. But what do we actually measure? And how do we do it? There's a new science in analytics growing organically in the industry. Everything from being found, to sales and customer acquisition, to usability and campaign testing can be measured and gauged for performance. Need to know how well the 4Ps are working for you? Sure you do and we have the best solutions at netmarketing.